Within a few short months of the establishment of karate in the British Isles in 1957, women became actively involved. Following the same format as Layton's two Shotokan Dawn, The Shotokan Dawn Supplement, Shotokan dawn over Ireland,and Shotokan Horizon, the meticulous eye for detail and historical accuracy of those books is clearly evident here. Using information elicited from the British Karate Federation archive as a backbone, and incorporating interview material from two senior British Female Shotokan karateka, alongside early male instructors who welcomed women trainees, Drs. Layton and Muthucumarana have succeeded in writing a wonderfully readable account of a much neglected subject. 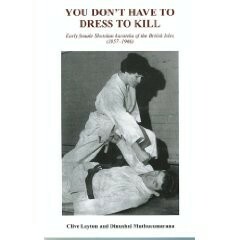 You Don't have to Dress to Kill is a brilliantly researched book that ensures that these early women practitioners are recorded for posterity.